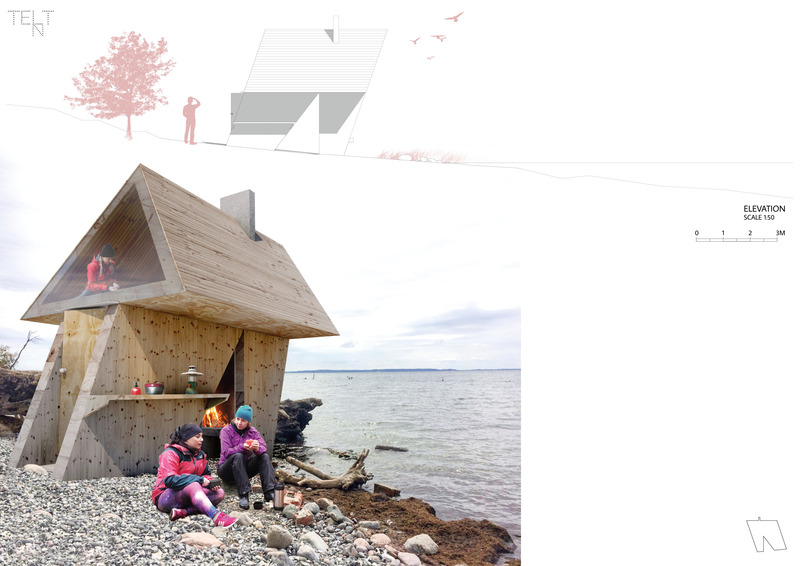 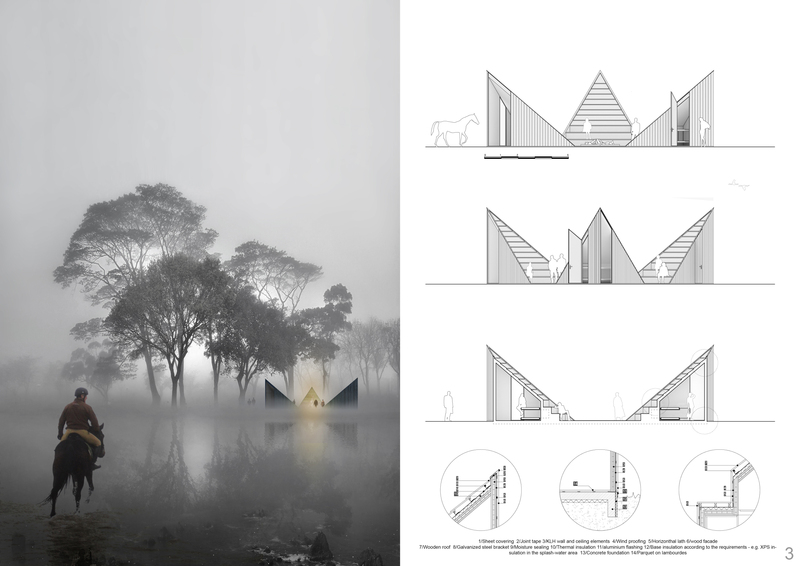 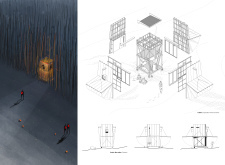 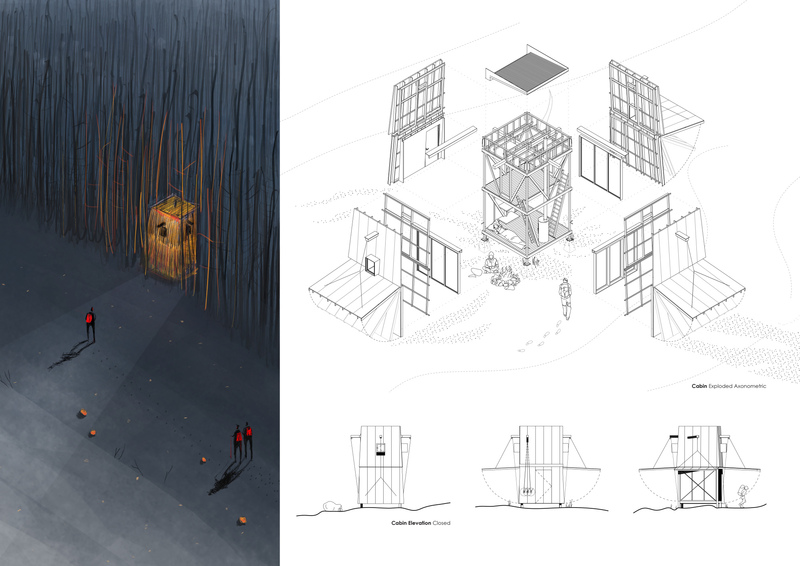 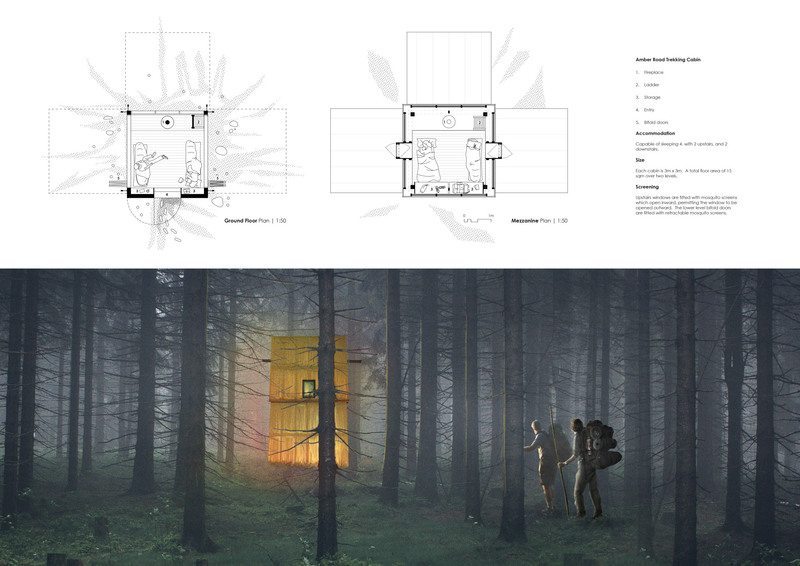 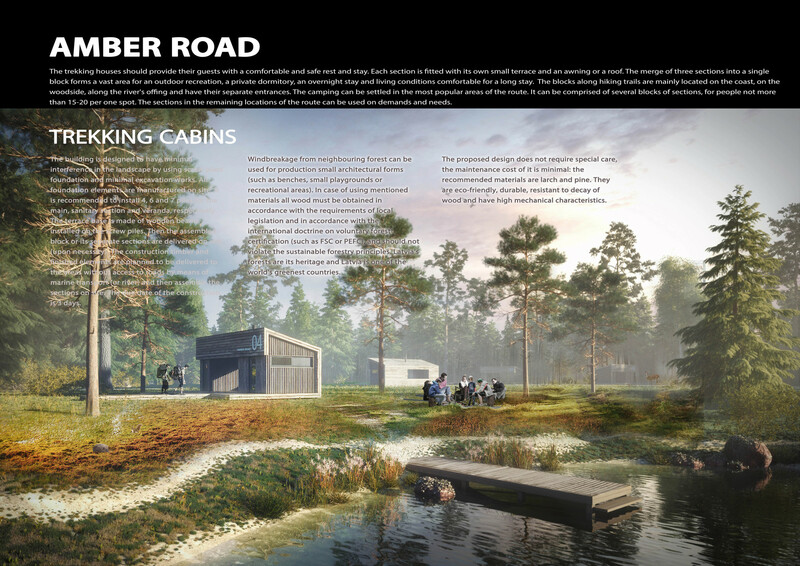 The Amber Road Trekking Cabin competition calls into question the periodic, historic challenge of the situated object: contextualizing an architectural artifact in the pastoral landscape. 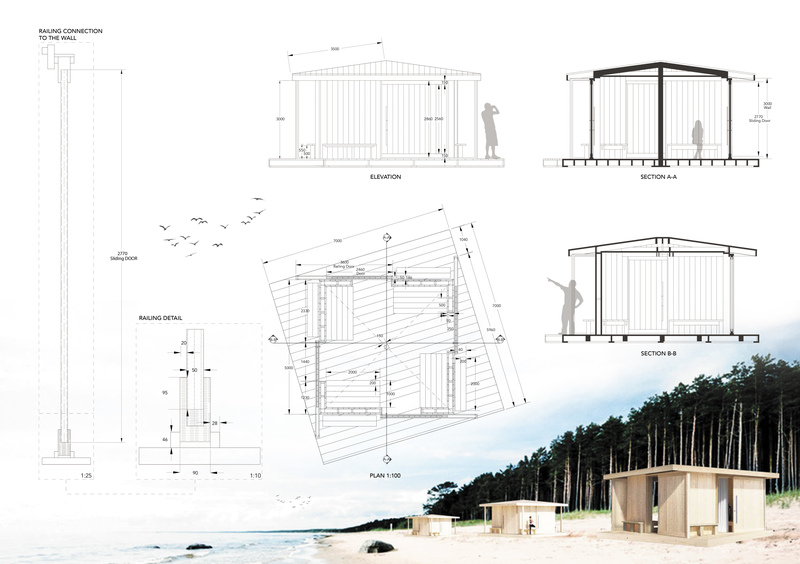 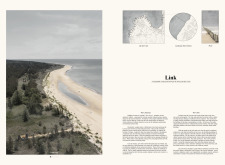 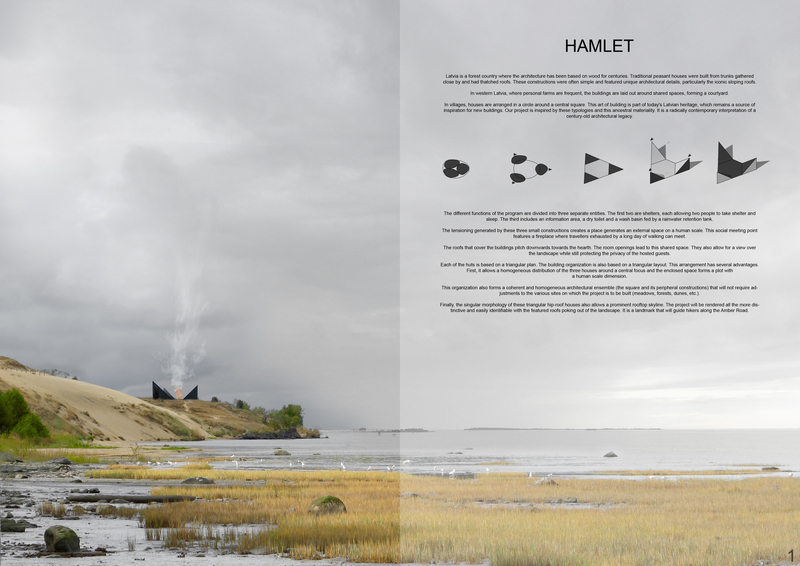 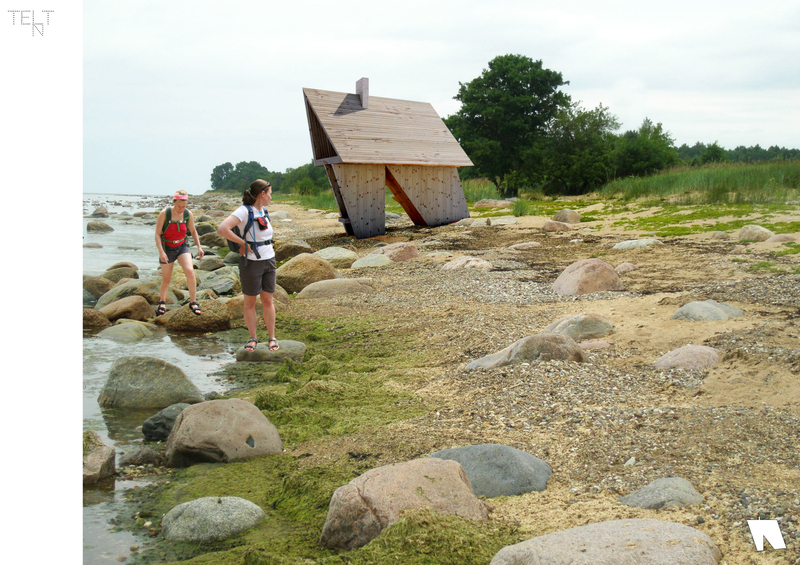 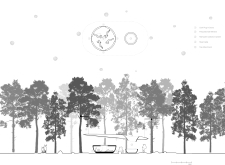 Along vast topographies of the Latvian Baltic coast, the project seeks a low impact, transient and inhabitable infrastructure in support of an anticipated hiking network transecting the various landscapes definitive of the region: pine forests, dunes, and white sand beaches. 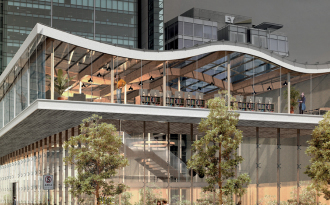 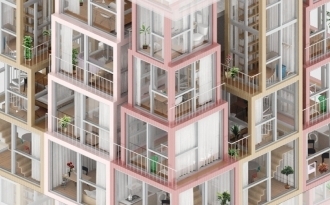 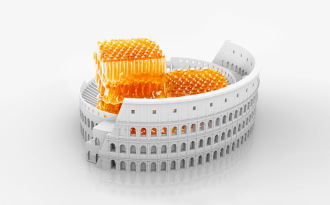 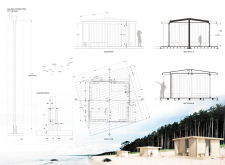 Successful projects respond to programmatic requirements of the brief with consideration of economic viability, securable enclosure, utilitarian function, constructibility, and climatic sensitivity. 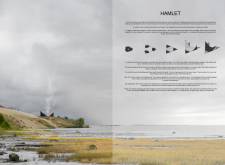 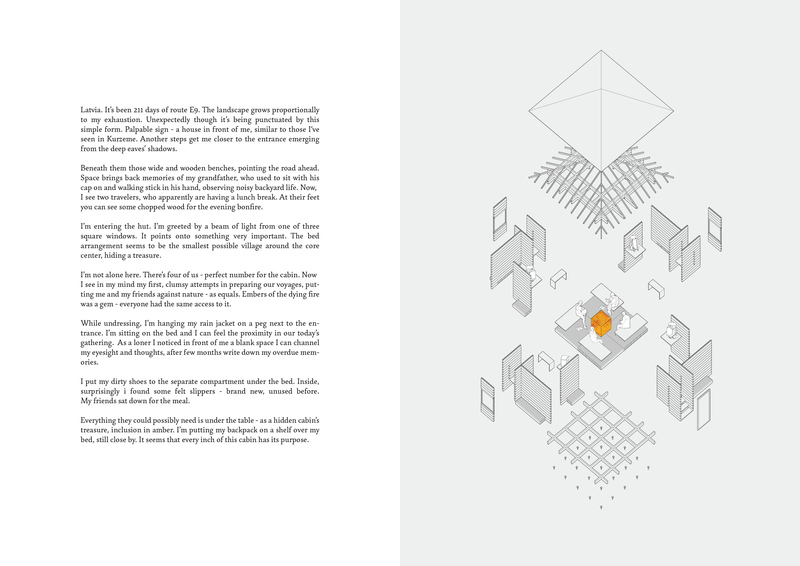 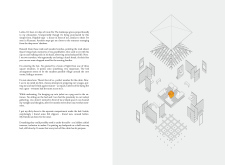 Evoking disciplinary antecedents, including lineages of the primitive — architectural speculations of Perrault and Laugier; the ideality of Eden, the pictorial and the picturesque — proposals consider modalities of contingency and circumstance demonstrated through exploration of typology, cultural gestalt, and monumentality. 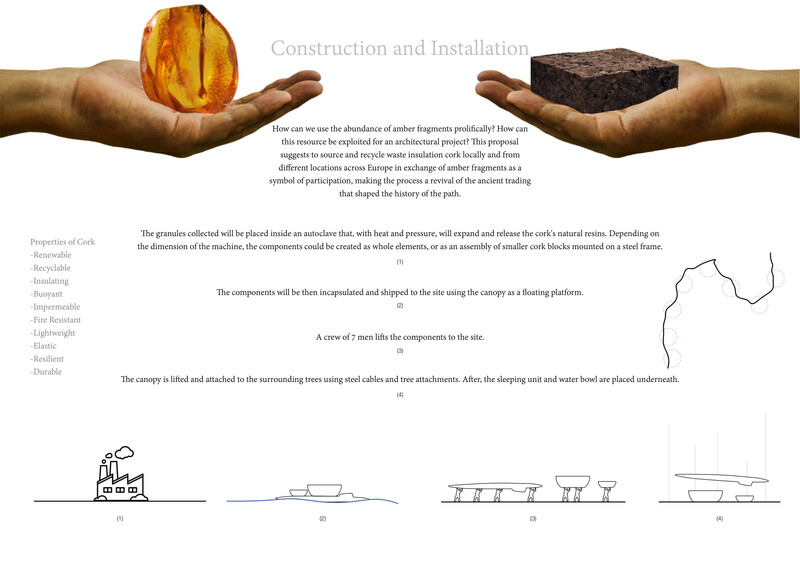 Successful projects evidence an awareness and invention of materiality, siting, programming, and negotiation of public and private relationship. 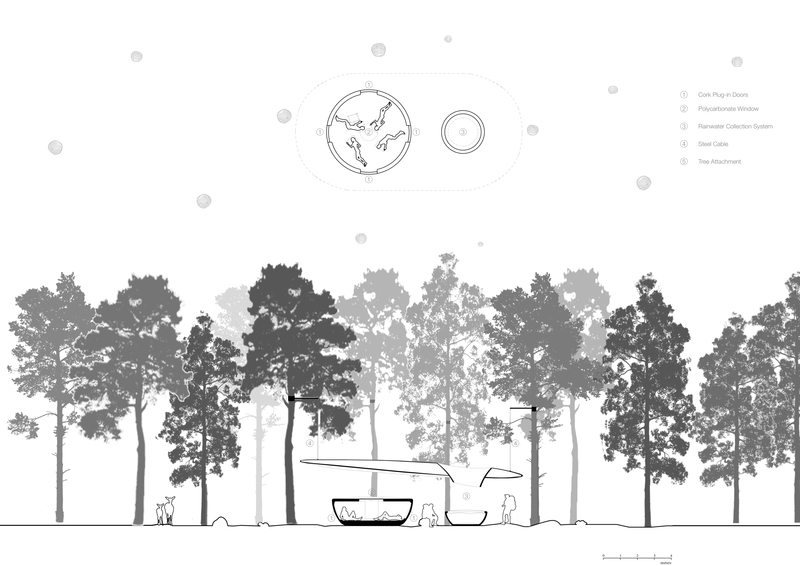 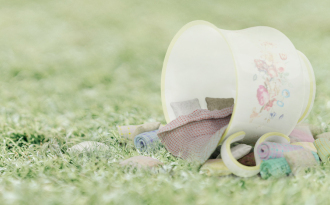 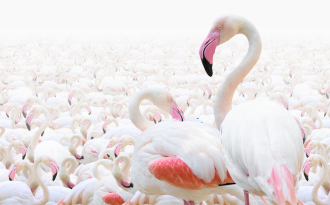 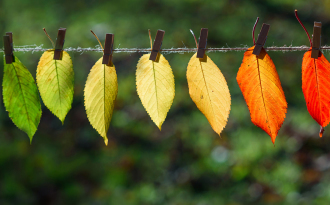 The competition collectively provokes reflection of ecological conservation and its prescience in contemporary cultural and social practice, serving as an economic alternative to the commercialized, industrialized landscape definitive of global capital interests. 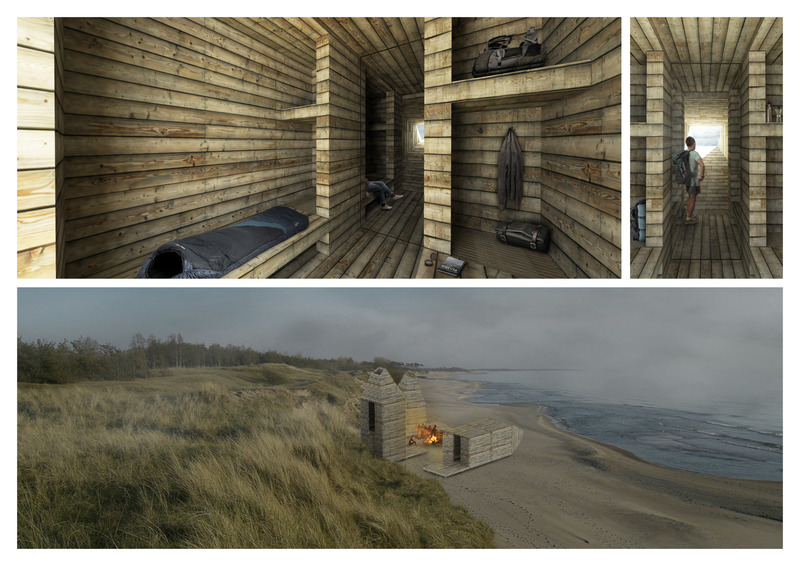 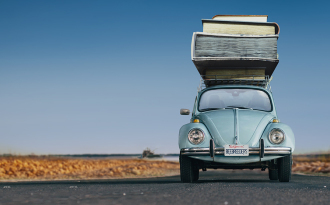 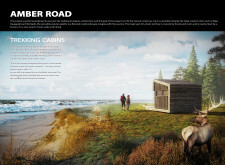 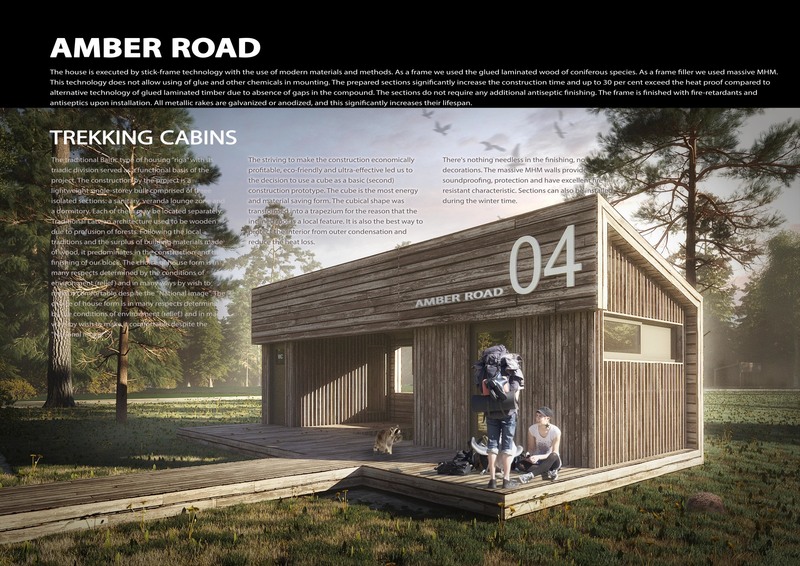 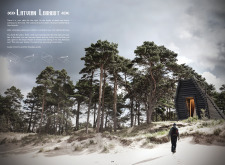 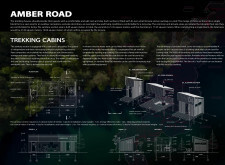 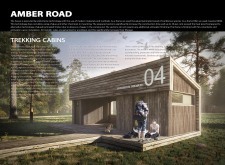 Amber Road Trekking Cabin competition winners revealed! 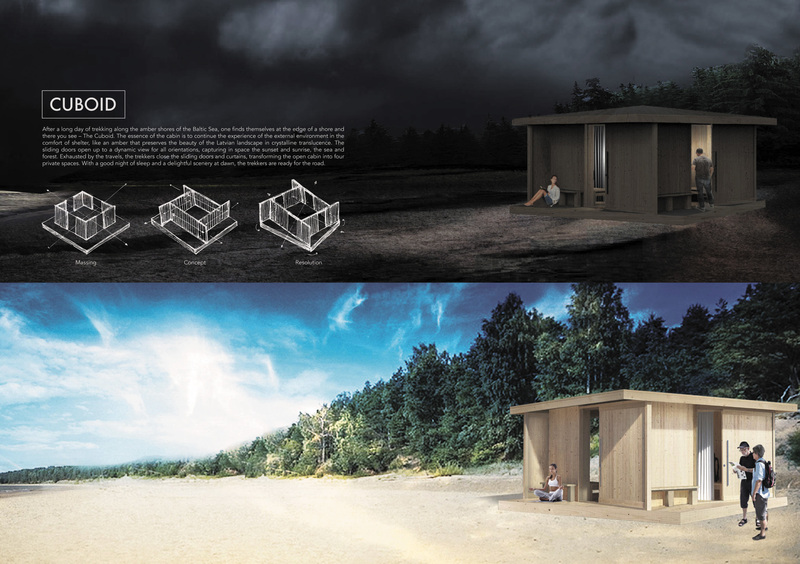 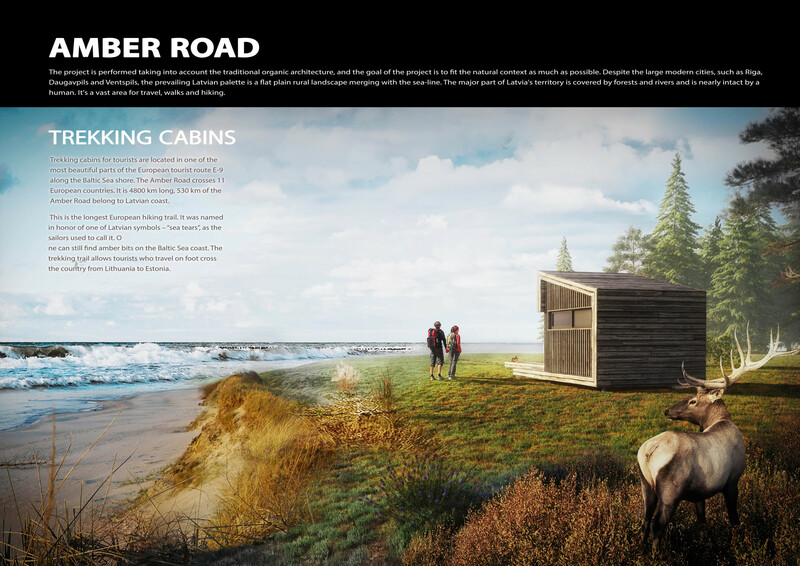 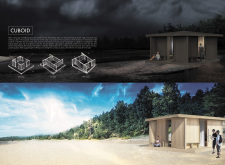 The first place project LINK for the Amber Road Trekking Cabins was chosen for its strength as both an architectural and landscape proposal. 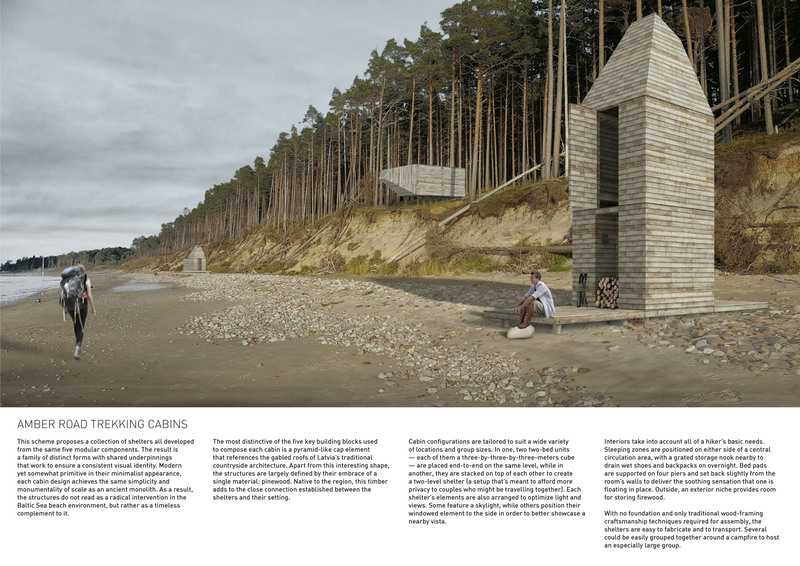 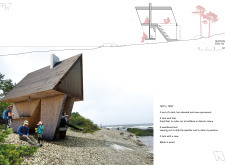 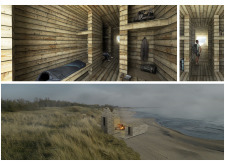 The project introduces a series of wooden moles, structural piers used as breakwaters, to connect the coast to the interior terrains of the Latvian landscape. 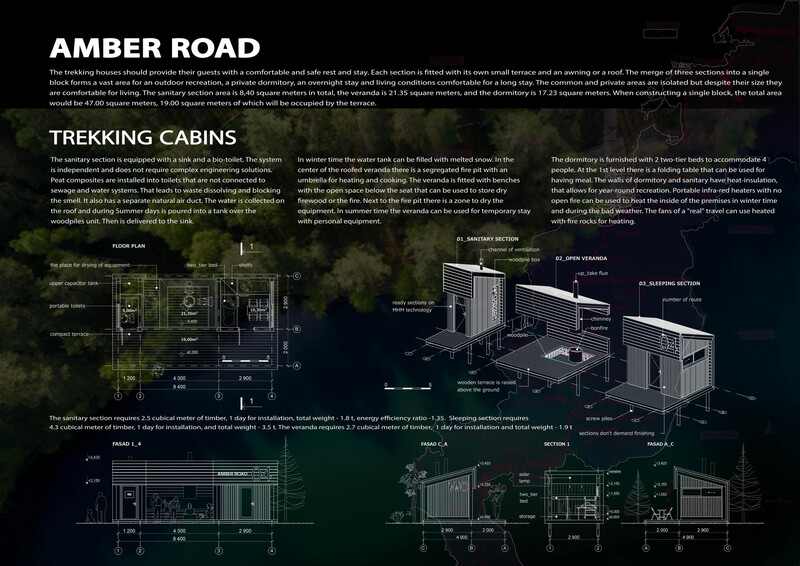 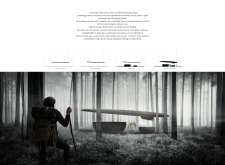 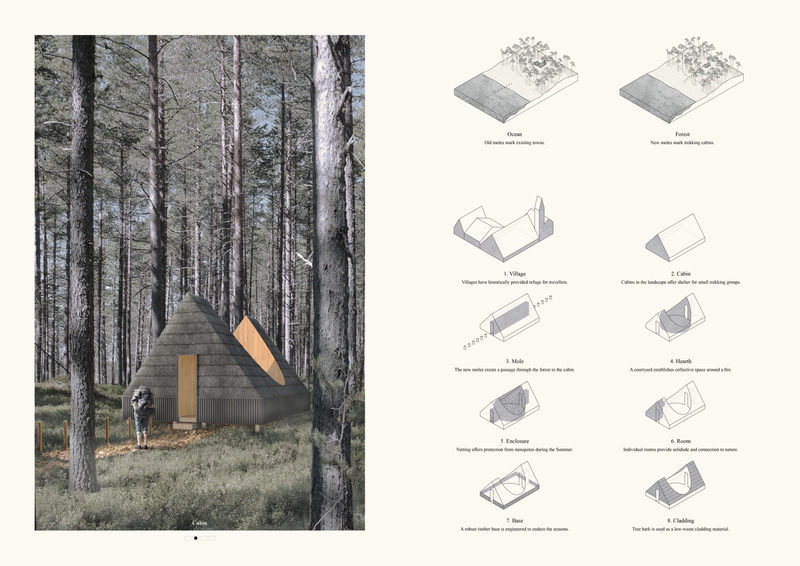 By creating a network of narrow passages leading to the trekking cabins within the forest, LINK pursues an alternative mode of conservatism - creating low impact architectural interventions within the native ecologies of the site to preserve the natural landscape. 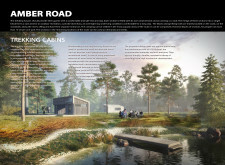 Through the use of pre-defined paths within the wilderness, there is no disruption of the wildlife or environment of the site. 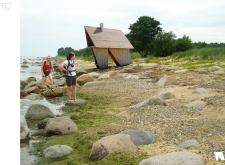 The cabin itself is successful in its contemporary re-appropriation of Latvian vernacular architecture. 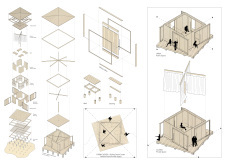 While the exterior figure of the cabin mimics the archetypical form of the primitive hut, the interior spaces of the cabin subvert this initial reading. 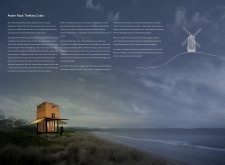 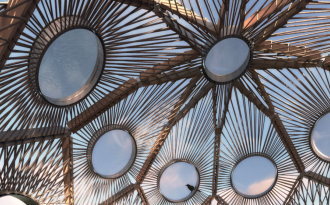 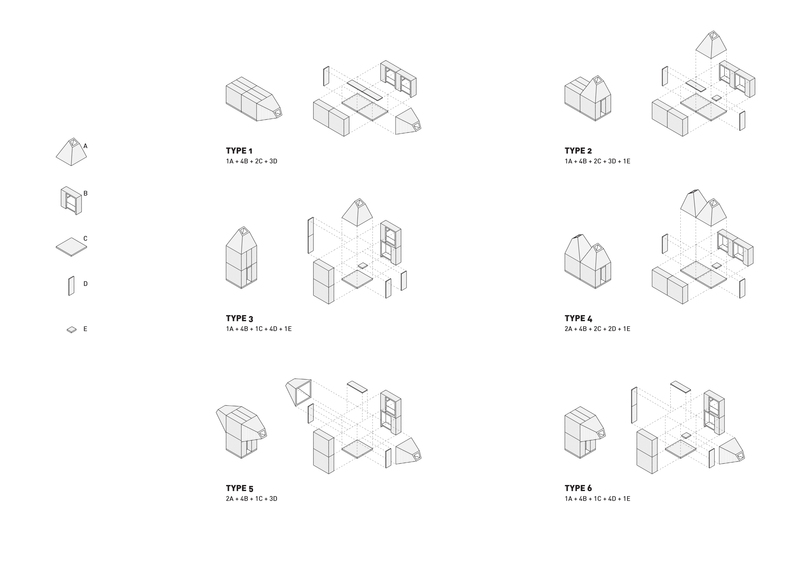 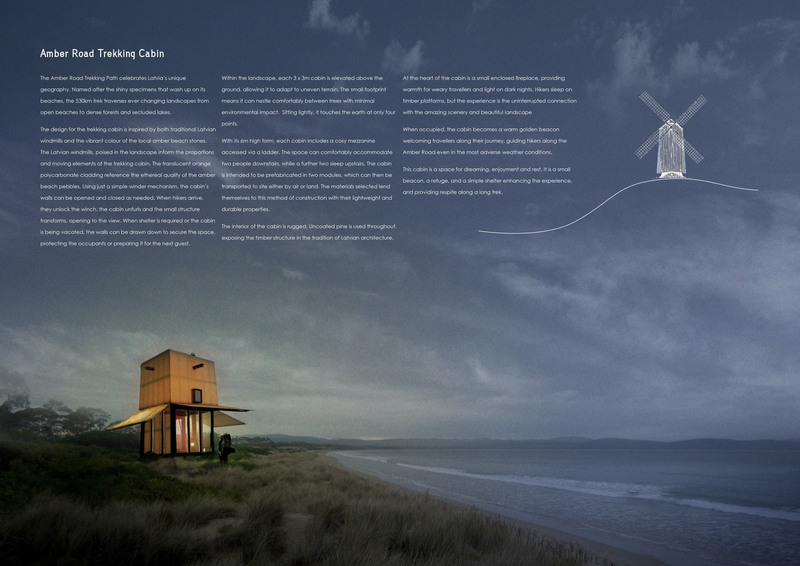 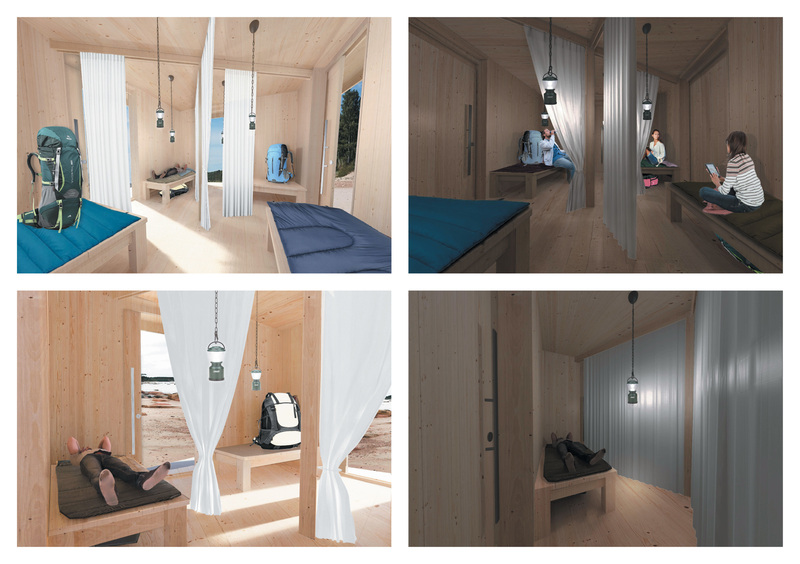 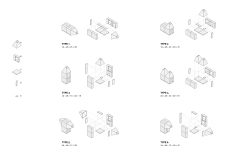 Each cabin is derived from a morphology that enacts both collective and individual modes of inhabitation. 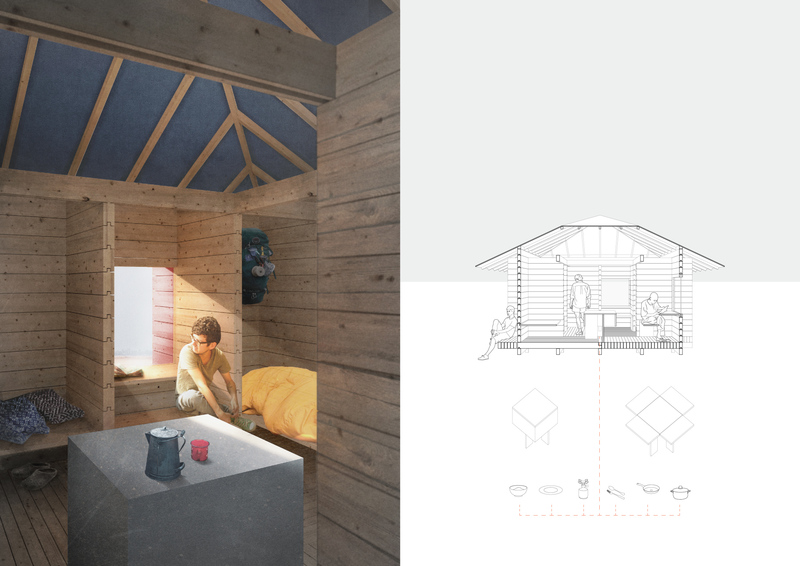 The center of the cabin is in fact a voided exterior space, a booleaned cylindrical hearth that carves out the interior of the proposal. 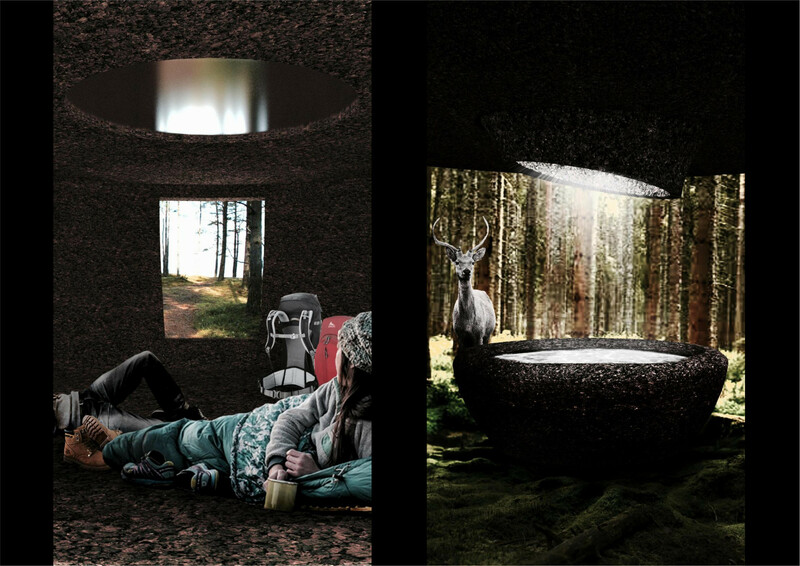 This circular outdoor space is surrounded and sheltered by four interior rooms, one at each corner, allowing for private space for each hiker. 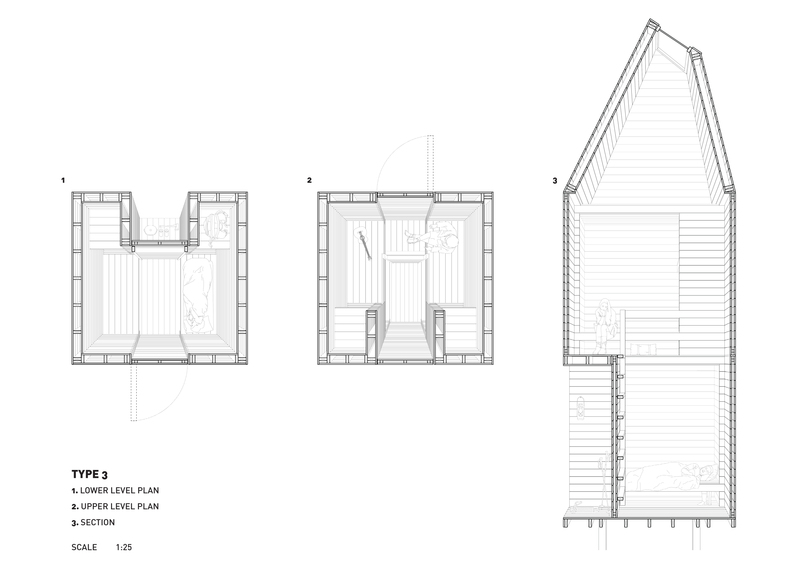 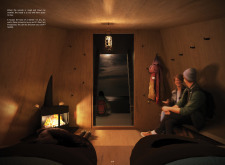 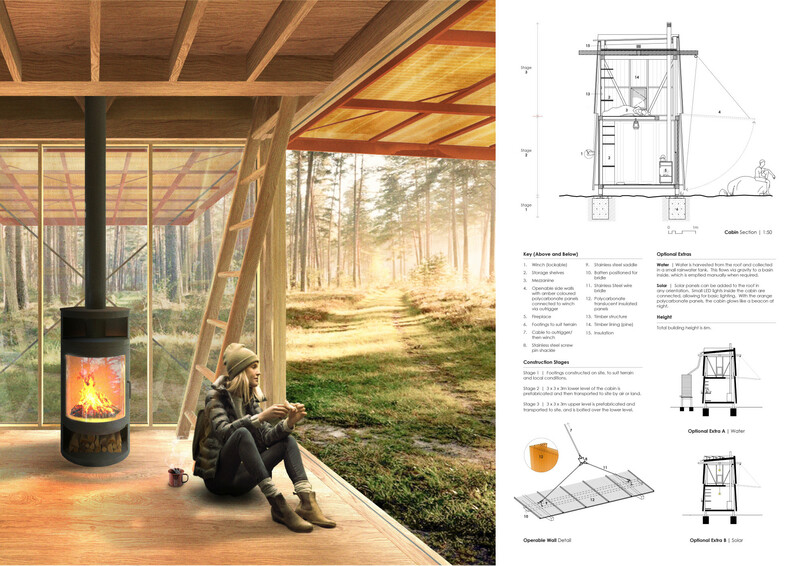 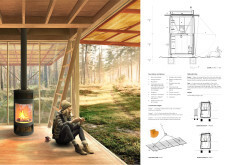 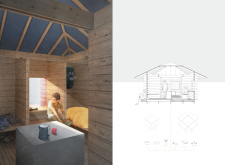 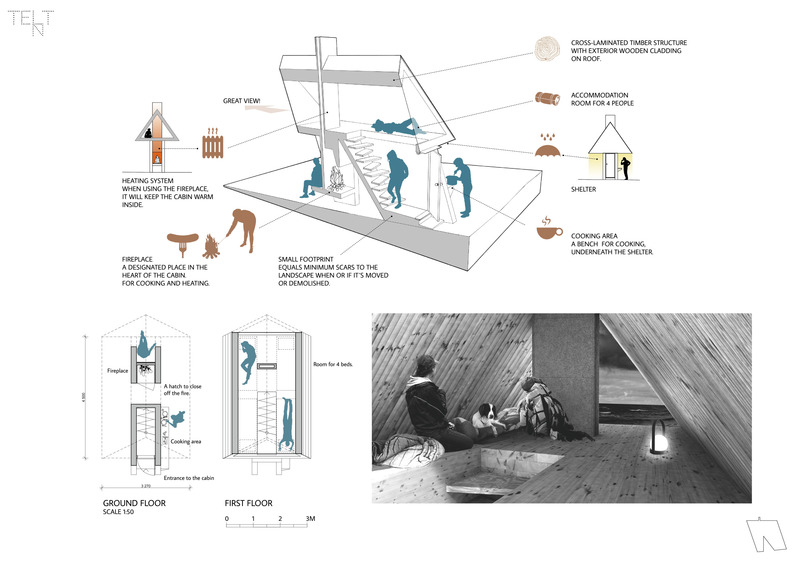 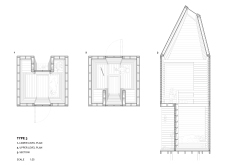 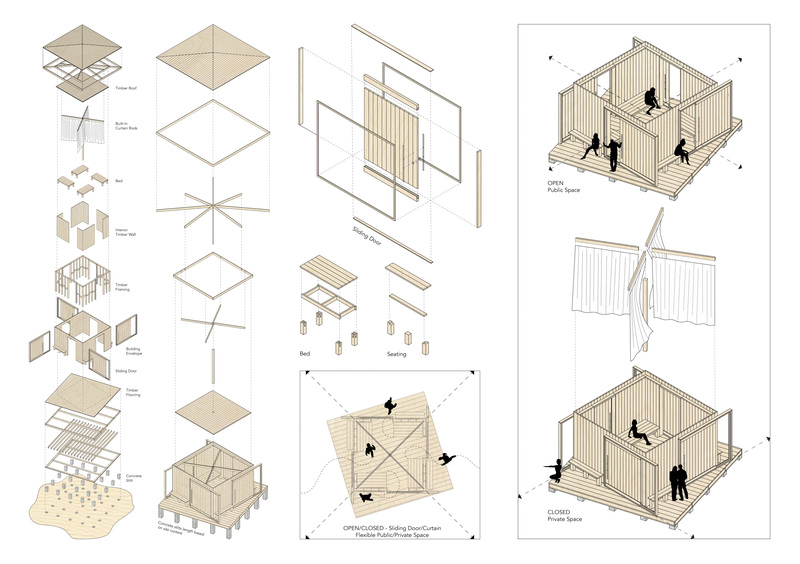 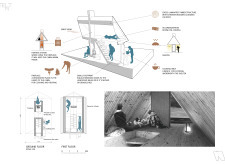 It is this adaptation of the iconic form of the vernacular archetype into a new spatial typology of collective habitation that creates a productive tension between the shared space of the hearth and the private space of the cabin. 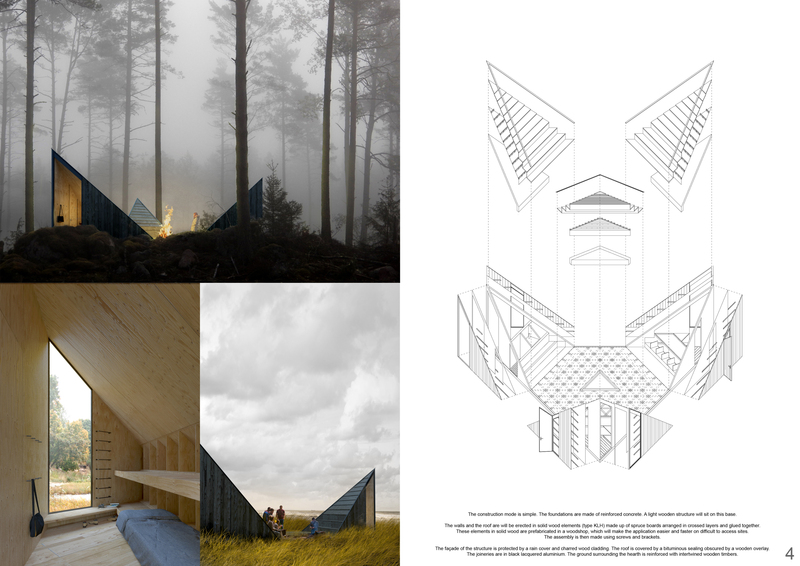 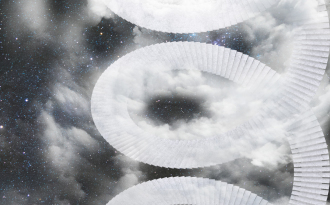 The success of the second place proposal lies in its ability to simultaneously delineate the privacy of the individual and promote a collective ethos within a very compact footprint. 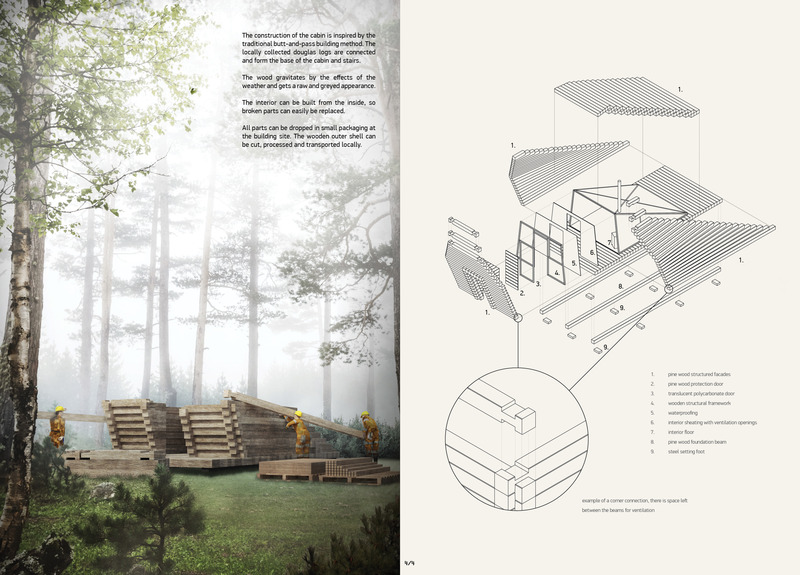 On the interior, the organization of notched and stacked raw timber walls pinwheel to alternately generate nooks for sleeping and desks for contemplating the landscape. 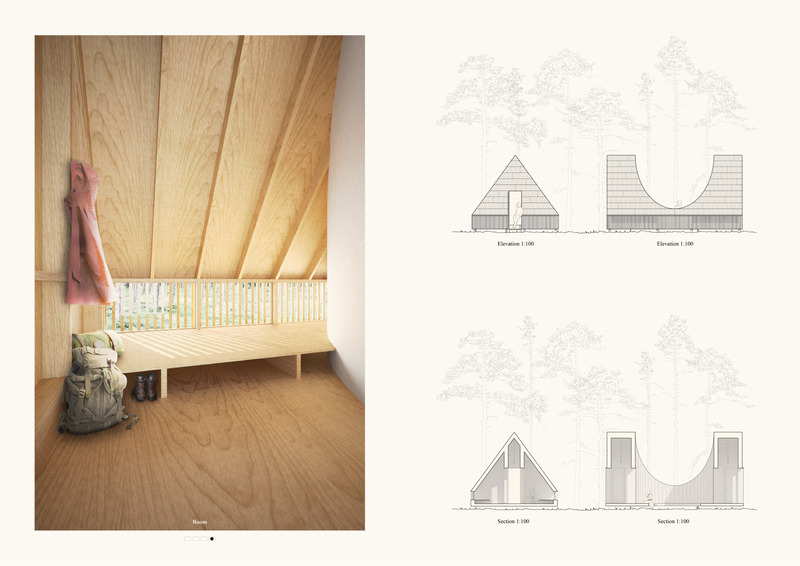 These private spaces surround an open central area for communal cooking, eating, and conversing. 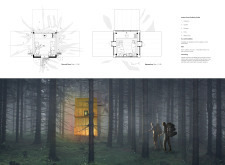 The architecture allows the temporary inhabitant to choose between seclusion and company without resorting to the total isolation of autonomous rooms. 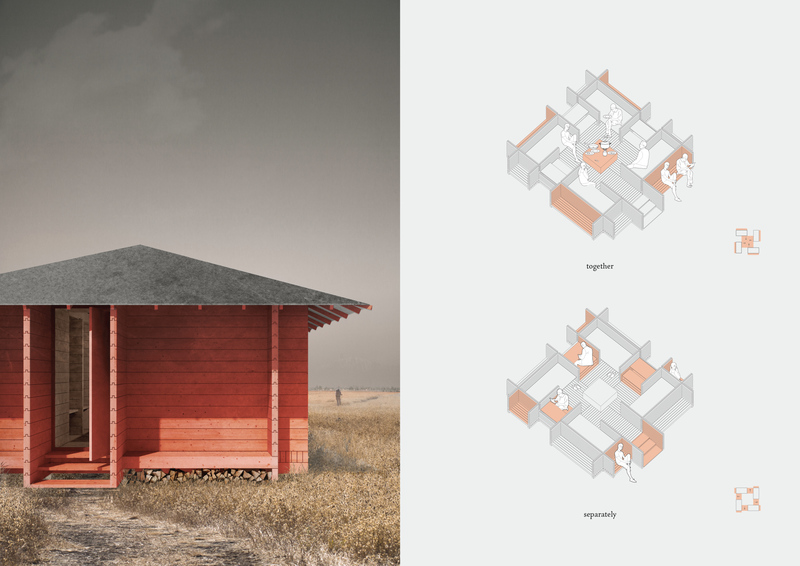 On the exterior, the stacked timber walls are painted a deep red, and their rotation about the center creates a thickened space with private exterior benches and storage cubbies for firewood. 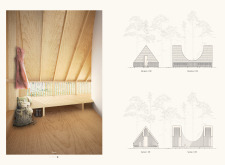 A simple pitched roof exerts a strong presence over this pinwheeled poché, clearly demarcating the space of sanctuary and transitory shelter from the elements. 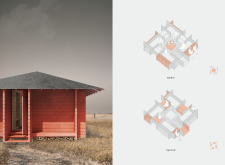 The project looks to Latvian vernacular building types as formal reference to evoke images of pastoral agricultural structures already present in the region while the red of the exterior wood establishes a familiar and visible language that does not detract from the color palette of the natural landscape. 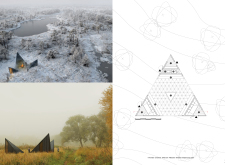 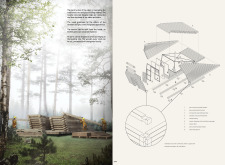 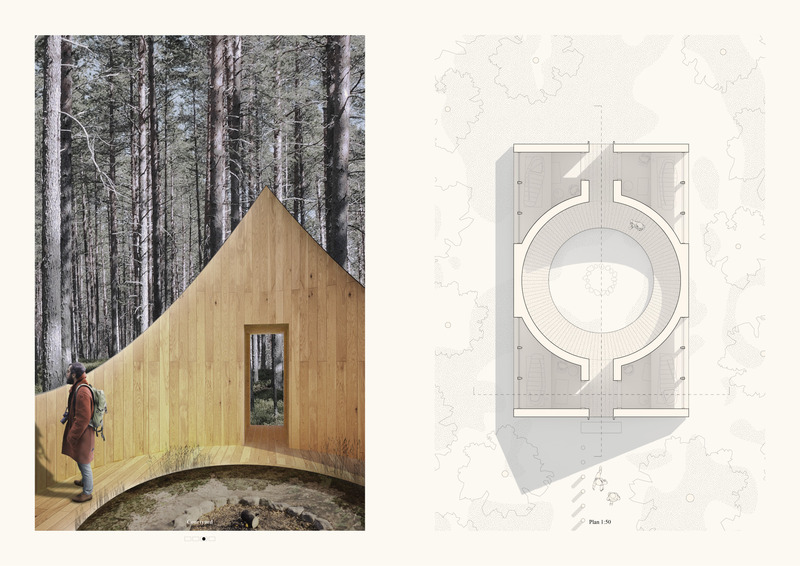 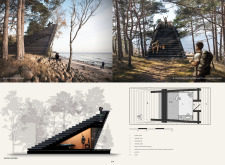 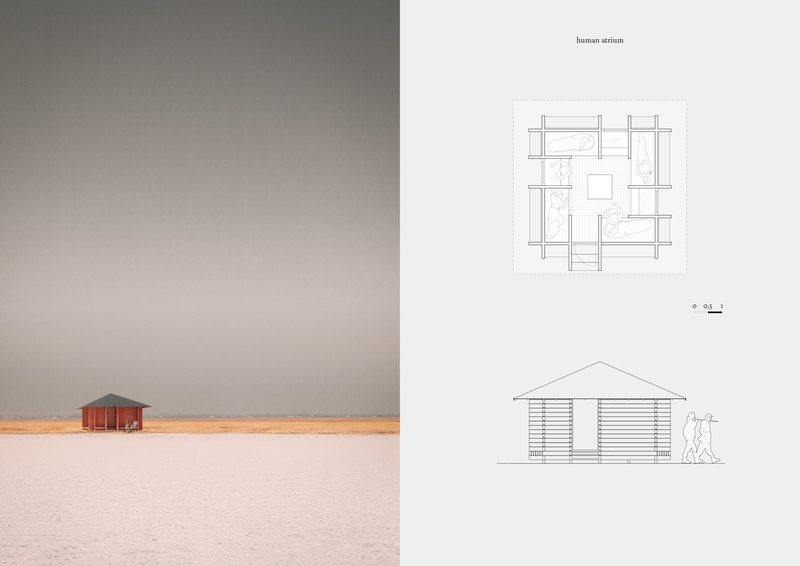 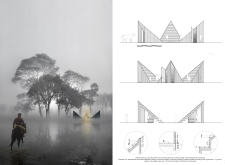 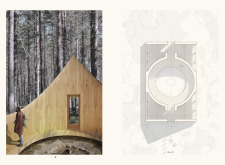 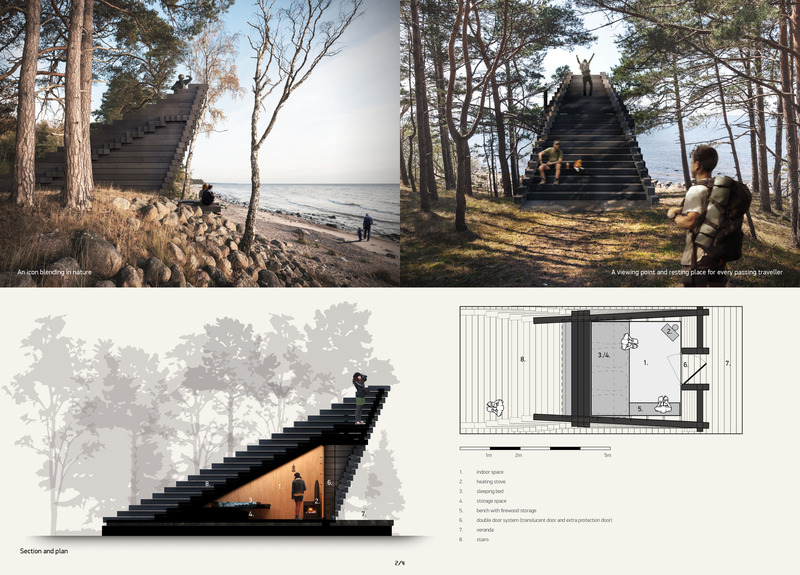 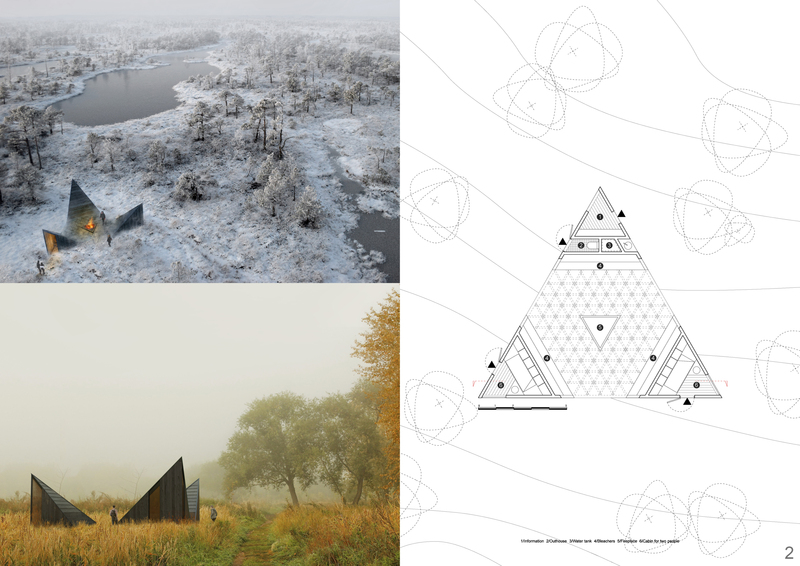 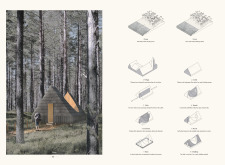 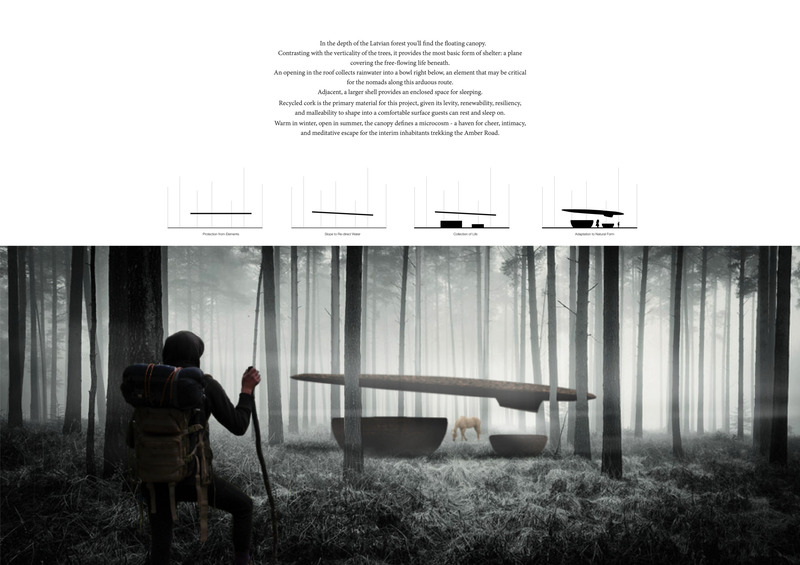 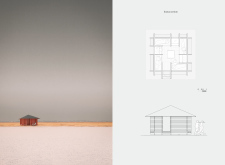 The simple but potent parti of the proposal and the iconic stature of the form combine with the sensitivity of its construction details to produce a proposal that is ultimately buildable and architecturally responsible in the context of the Latvian wilderness.